As the marketing voice of the City of Alexandria, Visit Alexandria is responsible for increasing tourism and convention revenues. 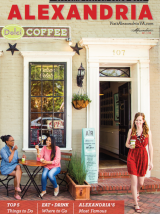 In an increasingly competitive market, Alexandria must aggressively promote itself to grow. As a member of Visit Alexandria, you join with hundreds of other members to form a strong, unified presentation of Alexandria that is extraordinary. Our collective marketing presence is more meaningful and more visible than what any of us can do individually. Contact Melanie Fallon, Director of Member & Visitor Services, for membership pricing and full benefit information (703) 838-4725. Existing Members— Here&apos;s how to renew! Exclusive access to banners on our website through Destination Travel Network; often the #1 direct link to member business websites. Contact Trisha Meisner for information. Exclusive access to advertising in the Official Visitor Guide (circ. 350,000). Contact Chris Dunham for opportunities. Exclusive access to advertising on the Official Map (circ. 320,000). Contact Chris Dunham for opportunities. Or for more information, contact Melanie Fallon, Director of Member & Visitor Services at (703) 838-4725.